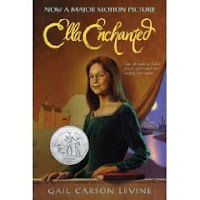 I had heard of the Ella Enchanted movie (haven't seen it), but didn't really pay much attention to the book until Sarah (Library Hospital) reviewed it. If Sarah enjoyed the book I figured I would too and I was not mistaken in my assumption. When you think of the Ella Enchanted, the book, think Robin McKinley for young girls. In other words, this is Gail Carson Levine's attempt to write a variation on the theme of Cinderella. It is yet another retelling and it done quite cleverly. I enjoyed it. While I did think this story was cute, clever and funny there were also aspects of it that bugged me. I probably wouldn't hand it over to any daughter of mine without some discussion. It is a little weird to hear a fifteen year old talking about a deep committed relationship with someone and that caught me off guard. There is also the aspect of her present and yet absent father. Her father spent most of her growing up years away from home and when he was home he rather appreciated her being out of sight. There is no love loss between them and so if you want to build good family relationships in your home (and if you have them established!) the hands-off approach to parenting which is displayed in this book would be disturbing to you. Ella's mother, who dies suddenly, is presented as the real parent who truly loved her daughter. Ella's father is the wandering cad. I didn't care for that aspect of the book. That being said, it is still fun, fluffy fiction and I thoroughly enjoyed it for that. It's really cute but there are a few things about it that give me pause. This story by Levine is perfectly clean and I want to make that clear. It is a good book to make a chick flick out of although as Sarah mentioned, the book and movie have little in common. It's whimsical, it's lovable and creative. In short, it's fun. For my part, Ella Enchanted was a fabulous entertaining read but I'm not overly attached to it. I listened to the audiobook back six or seven years ago. I thought it was fun, and the reader (?) did a good job. I'd probably like this book, but I have never got around to reading it. I read this a few years ago and had some similar issues with it, but it was definately a fun, easy read.. I loved it too (and so did Amanda). If you want to update your link with this one, it is available in paperback. For some reason, the image just doesn't show up when you search it. I got to it by searching by author. Odd. If you think that the book is light and fluffy than you'll think that the movie is even more so! My 7 year old niece could watch it over and over. I've seen the movie but haven't read the book. I vaguely remember liking the movie and thinking it was cute. I saw the movie and loved it, but when I tried to read the book I was bored. If you see the movie don't expect it to be the same... it's more modern and quirky, and more fast-paced. I've had this book on the shelves for a couple of years and really need to get to it. It sounds like one to read when I need something light. I remember reading this in middle school, a friend of mine was obsessed with it! I don't remember much about it, except I enjoyed the book, but not the movie. I loved Ella Enchanted and it's been a while since I read it. I didn't care much for the movie. I hadn't thought about the concerns over the dead beat dad and getting in a serious relationship. Good idea to discuss it before hand. It's the only book where I've preferred the movie! The book was so-so for me. Its a clever retelling of cinderella and i was much surprised at how good the book turned out being apprehensive about a retelling of the popular fairy tale.I never thought about the aspects mentioned in the review but i can assure it is a good read!